Tips for photographing falling snow? Discussion in 'Digital Photography' started by kallisti, Feb 14, 2014. I love being outside when snow is falling, especially when the flakes are big and falling slowly. Sounds get muted and it creates an almost magic experience. I've had horrible luck trying to capture this feeling in photos. Some of it relates to photos being only visual. 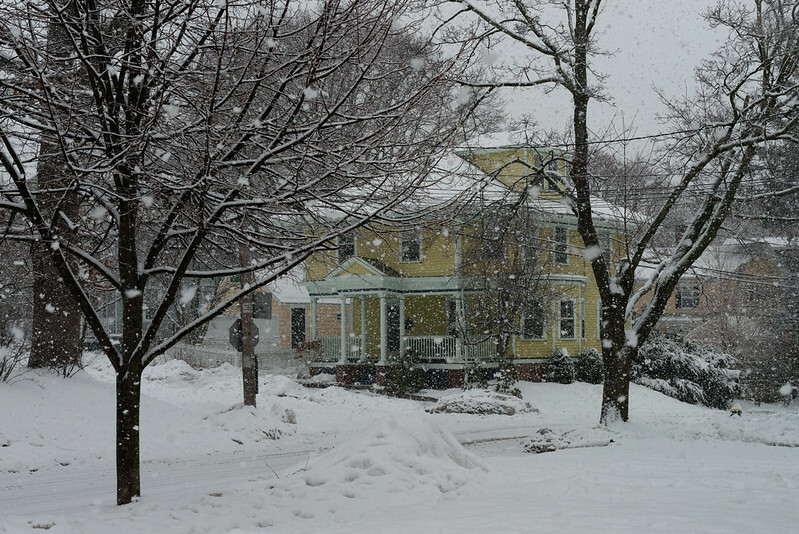 Some relates to the 2D aspect of a photo while falling snow is really a 3D experience. 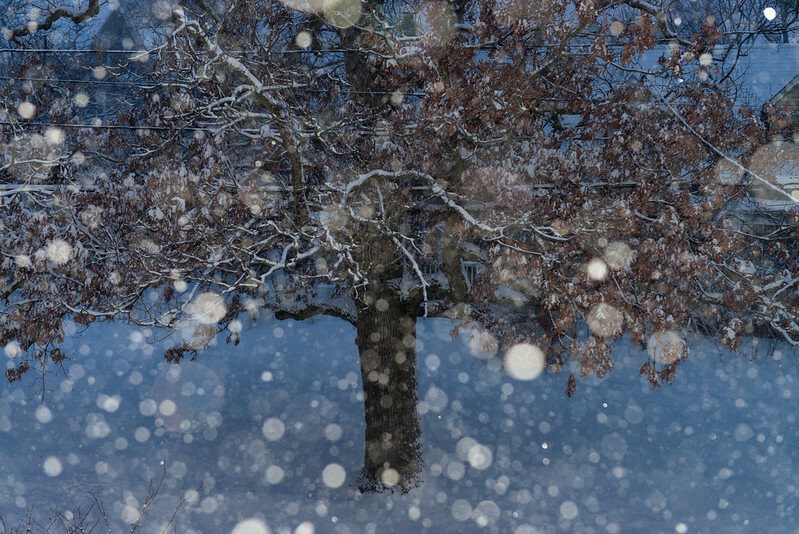 Some of it relates to falling snow being a dynamic experience while photos by nature are static. 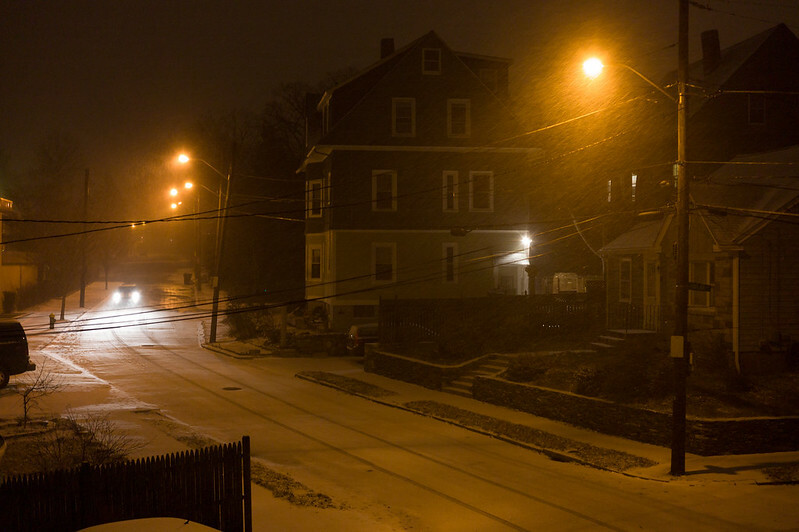 I've used longer exposures to create lines of whiteness that make it look like a blizzard. Creates atmosphere, especially when the snow is falling fast. But I've really struggled with large snowflakes falling slowly. Have tried fast shutter speeds which create distinct white blobs all over the frame. Not horrible, but not close to what the eyes actually see when out in a snow storm. I've tried slow shutter speeds which create the above mentioned blurry snow lines. I've tried large apertures and small apertures. Many, many years ago I tried flash. Thoughts? Are there any tricks to make a scene with falling snow approach what our eyes see? Well not living in the UK would be a good start. We haven't had any snow here this year. Have you tried illuminating them with a flash? That should make them stand out, especially at night. I haven't tried using flash with falling snow for several years (back when I was using film). If I remember right from prior attempts, the results aren't satisfactory. 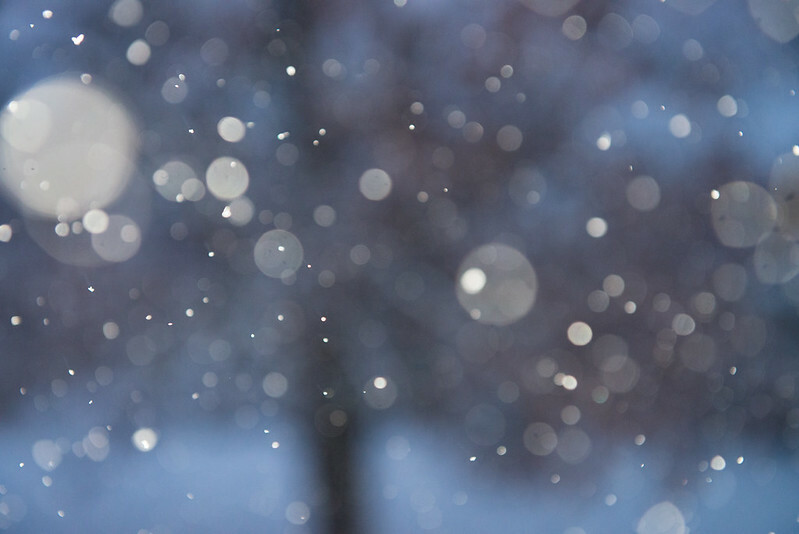 Snow flakes are extremely reflective--like little mirrors. Using flash when photographing them creates little point light sources in the image. Been awhile since I attempted this, so I could be off. We are expected to get more snow tomorrow so I may revisit this and post pics. You would have to use either a higher shutter speed, or a flash as Apple fanboy said. I have't experimented too much, but whenever I've taken pictures while it's snowing if the flash goes off you just get bright spots from all the light reflecting off of the snow. How about this image? It was taken with f/5.6, 1/800s, 244mm focal length. It is tough. I suggest trying to find a dark background so the snowflakes stand out. Try different focal lengths and focal distances to get the effect you want. In the end you might be happier with a short video. Another think difficult to photograph is the deep grass we have on the hillsides in California. The image is full of very fine texture that is difficult to capture in a camera and then display on a monitor. The effect is rarely as satisfying as looking at the real thing. This shutter speed should be more than fast enough since the snow was falling slowly. Still doesn't really grab the "feel" of the moment. Maybe not possible to capture it in a photo. If the snow comes tomorrow as expected I'll take a shot with flash to show what you get when you go that route. Just bummed that I can't seem to really capture the feeling of being in falling snow with a photo. Maybe another way around this is to shoot HD video then extract the frames you want...iMovie will allow you to view each frame. Totally understand kallisti - snow and Michigan we get a lot, and yep hard to capture the feeling. I'll have to keep that in mind for the next storm. I took a couple Saturday night as promised using flash. Focus was in the distance. The flash caught the falling snow as white blobs. Zoomed in to focus on the tree. Lots of white blobs. Decided to make it more abstract by manually focussing close. I like this artistically, but doesn't capture the moment at all. First - I think your photo does a good job of getting close to the 'feel' of a snow fall. The flat light is a tough one to deal with because a good snow fall almost always needs heavy clouds. Visually, you've done a good job here. What you can't capture of course is the silence of a heavy snow. Reread ApfelKuchen's post.... especially the bit about street lights. Basically, try shooting at night with the only light coming from sources that are not near year. In other words the only 'lit' snow is far from you and you will avoid those distracting white blobs in the foreground. 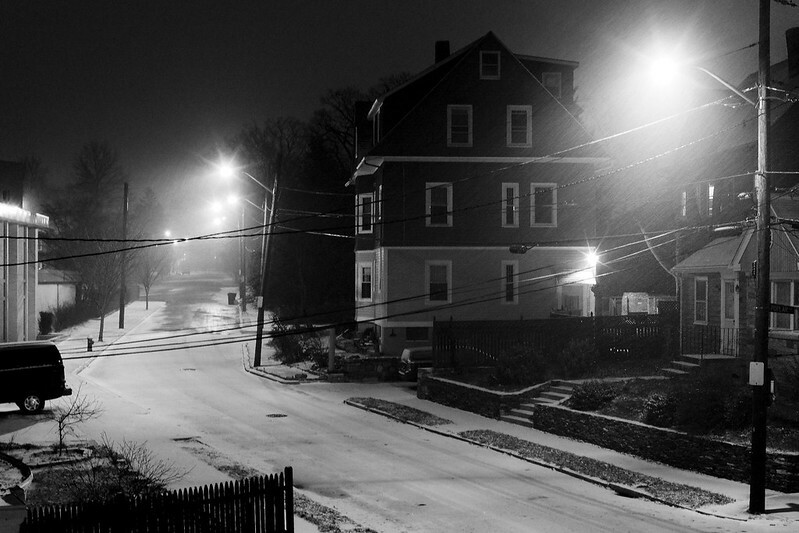 For example, and lone streetlight at night can produce very dramatic snow shots. The challenge is in the metering... you need to ignore both the light source and the black background when metering and just get the (usually) the pole properly exposed. Which is not as difficult as you may think. Thanks for the feedback (also to ApfelKuchen). Took this a few years ago. Longish exposure (1/8th sec) which blurred the snow coming down a bit. 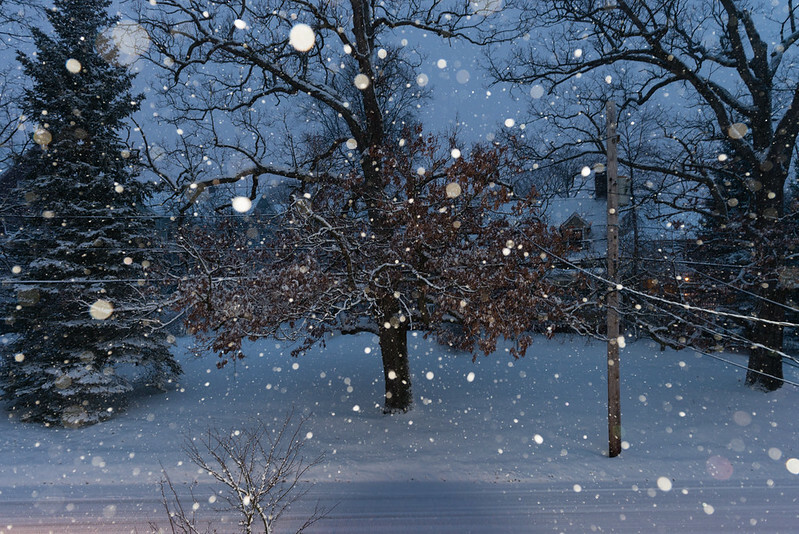 Might be more interesting with a shorter exposure to make the snow flakes more distinct rather than a blurred line. I think this is kind of what you were suggesting though. Took this slightly earlier before the car entered the frame. 1 sec exposure. This also created blurred lines representing the falling snow, rather than individual snow flakes. Need to try it at night with a fast shutter speed. Now looking forward to the next snow. I like the abstract one. Would off camera flash work better? when you are outside you are seeing it in 3 dimensions - your eyes are constantly shifting their point of focus from near to far. They are also following individual snowflakes while also looking at the background. Your brain is simultaneously filtering out the distractions - the wires, the brown spot in the snowbank, etc. Plus your eyes are adjusting their sensitivity so that the dark shadows are perceived dark and the highlights as white - feats that a camera sensor may struggle with. Plus you are looking at the scene in motion - like a movie clip. work with the emotional aspect and not worry too much about the documentary bits.
. the left third and the right third. The middle third does nothing, imo, for the photo. Just for fun I'm posting a print from Roy Henry Vickers. Even though he has not used 'raindrops' I think he has captured the "feel" of rain in this image. It's not my favourite piece of his, but it does show rain well. Whether or not they captured what you wanted, I love these photos! Can't get mtbdudex's photo to show as a thumbnail. Thanks Ish. I'm quite fond of the last abstract photo myself. Initially intended to just shoot examples of using flash with falling snow, but had a lightbulb go off in my head when noticing that the "problem" was that the flash on the snowflakes was creating distracting blobs compared to the background which was in focus. Decided that the problem might really be with trying to make the background the subject. When I shot that last abstract photo, it was exactly what I was trying to capture. Thank You. It's what makes this forums so good.... lots of good, constructive, yet opposing views (politely put forward) for people to mull over. I don't have much (any) direct experience in photographing falling snow, but it seems to me that if you are going to use flash, you may do better if you can get it off camera, as others have suggested. Otherwise, you are going to end up highlighting or maybe even over-exposing the snowflakes that are closest to you and the light will falloff as it gets further away into the scene (inverse square law, etc.). Also, what about trying to shoot from under some sort of cover (e.g., from a covered patio, under a tree, from inside through an open window, etc.) so there is some space between you and where the snow is falling? By inserting some buffer space between the camera and the snow, you may allow it to "see" the layer of falling snow more clearly, which may in turn help create the appearance that you are "in" the snow more than when you actually enveloped in it and trying to shoot through it. We're in a bit of a drought here in California, so I haven't actually tried either of these, but it may be worth experimenting. That said, I very much like your abstract photo. Are there any tricks to make a scene with falling snow approach what our eyes see? I hope that the very good feedback that you've received in this thread has made you aware of just impossible it is to answer your question. There is no way to define "what our eyes see" because all vision get filtered through the brain, and everyone will therefore "see" differently. What ultimately matters is what you are seeing and experiencing and what mood or message you are trying to put forward; and only you can know what that is when you're standing there watching the snow fall. As always, thanks Phrasiklea. Very good points. I probably phrased my question poorly. With all the snow we've had this year I decided to focus on the best ways to capture it in a photo. Hard to translate a 3D experience into a flat 2D image. The replies in this thread have been extremely helpful. I rarely use flash and wouldn't have tried it again without some of the early replies. The dialogue has also helped me rethink what I am hoping to capture when shooting in falling snow. One of mtbdudex's images and neutrino23's image got me thinking a bit about selective focus and when I made the shots with flash I decided to manually focus close so the snowflakes (and their reflections) would serve as the subject instead of the background being the subject. I'm happy with the resulting image. My initial question was phrased in an impossible way: what I should have asked was for ideas on various techniques to capture different aspects of the experience of being in falling snow. We are expecting more snow Monday and if it's still falling when I get home from work I plan to try experimenting using off camera flash as several here have suggested. The challenge as you state is always to figure out how best to use the tools at your disposal to create a visual image that clearly and simply communicates a message and mood. I'm not sure how much DOF played a role, but I shot both the above at f/1.4 using my 35mm prime. I think this is good advice. It will allow you to get a consistent size of snow flake rather than what look like giant flakes (near) and tiny flakes (far). To support my point above, I think the darker background of the bushes and snow pants make this one effective. Very nice. I especially like the first one. Having the subject in the foreground works well as does having a dark background.